Hello everyone and thanks for coming back. Last post, The Cover Art, I was able to show you the artwork showing Aiden Locklear wearing his Lightplate. I’m pleased to be able to say that I have the next piece, The Guardians of Atlantis, done now also. You can see the other artwork in the Gallery. The continent of Atlantis is actually a giant plateau that rises out of the Mediterranean Sea and the Atlantic Ocean. The rise is steep and this creates sheer cliffs that surround the continent. 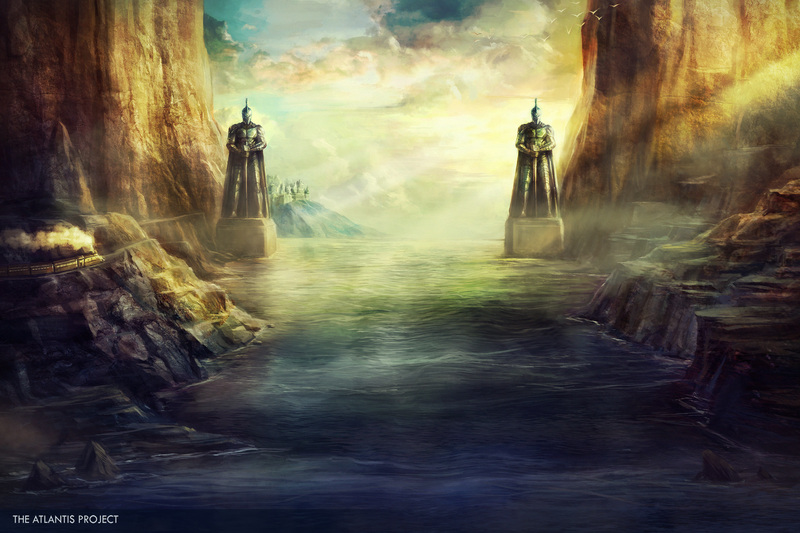 The artwork shows one of the entrances through what the Atlanteans call the Rim Wall. The Guardians of Atlantis are twin statues that were given to the Imperial Government by an Atlantean corporation. They stand on 100-foot-tall pedestals and the Guardians themselves are 400-feet tall. They are wearing Lightplate, the same armor that the Knights wear, and are a representation of the power and wealth of the Atlantean government. On the left side of the picture you can see a rail line and train on its way to the City of Atlantis in the background. The Port of Atlantis can’t be seen as it is outside the Rim Wall. The water of the Mediterranean hasn’t filled in yet so the river that you see is too steep for a ship to be able to sail up it. In next week’s post I’m going to show you my map and I’ll talk a little more about the geography of Atlantis; but I’ll quickly talk about the location of the city. The City of Atlantis is situated on the continent’s East Coast and is about 600 miles into the Mediterranean. This art, like the Cover Art, was done by HoangPhuc. In it he shows his skill once again and I can’t thank him enough for the hard work he put into making this a reality. If you like the artwork please share it using the social media buttons below this. Thanks! Dearest Jake, I also do believe in these things as you do. Nice of you to spread the information on these things as many overlook them. Since I was a child I saw large columns of stone in my mind….sea of blue, a city gone. I know Atlantis was real. Be well. Hugs. Tony Ramesar of Trinidad Island. Thank you Tony, though to be clear, the views expressed in the article and in my book are not necessarily my own.